Among the many topics explored during a lively Service Innovation Panel discussion at MEF17 were Service Innovation, SD-WAN and MEF 3.0. The industry executives sharing their insights and experiences were: Shawn Hakl, Verizon’s Senior Vice President, Business Products and an MEF Director; Josh Goodell, Vice President, Intelligent Edge at AT&T; and Gunnar Peters, Sr. Director of Emerging Network Products at Spectrum Enterprise. As nearly every industry is being disrupted by digital transformation and advanced automation, the pace of innovation in wide area network services needs to accelerate. Primary drivers of customer migration to new service offerings are the four Cs of Cost, Cloud, Connectivity and Control. Traditionally, the fundamental enablers for successful innovation have been new technologies. However, the panelists added several other key factors. Foremost is that customer input is vital to the development of innovative services that not only deliver value for businesses, but also can be profitably monetized. Enterprise customers want advanced services that streamline the user experience, optimize application performance, improve network visibility, and reduce operations complexity. They also expect much more than the virtualization of existing features and functions. Examples of service innovation include zero touch provisioning that spans multiple network domains, and self-service capabilities based on predictive analytics. MEF is focused on defining the service parameters and LSO API specifications that will make these types of innovations a reality for customers – as well as simpler and faster for network providers to deploy. 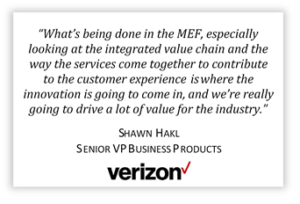 “What’s being done in the MEF, especially looking at the integrated value chain and the way the services come together to contribute to the customer experience is where the innovation is going to come in and we’re really going to drive a lot of value for the industry,” said Shawn Hakl. DevOps is another important component of the service innovation process, said Josh Goodell. The increasing complexity of developing new services has compelled AT&T to innovate differently, fostering a culture that can handle the risks of rapid, agile development. For example, a single development project may require the integration of sixty to eighty different apps. An ongoing challenge to the deployment of any new service is helping customers migrate their existing networks without business disruption. This undertaking is highly relevant now for customers migrating or evaluating a move from MPLS VPNs to managed SD-WAN services. Migration is not simple, cited Goodell. The reality is that most customers operate business-critical networks that they are not going to ‘rip out’, and many MPLS networks are not going away anytime soon. SD-WAN – Revolutionary or Evolutionary? The consensus of the panelists on managed SD-WAN was that these services are in certain ways both revolutionary and evolutionary. Everyone agreed that standard definitions for SD-WAN services are lacking and need industry agreement. 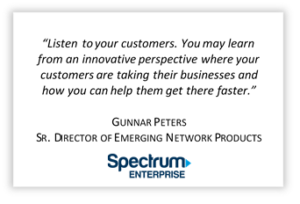 Emerging SD-WAN technology is revolutionary, said Spectrum’s Peters, because implementations provide customers with direct control over their network resources, plus better visibility into application utilization and performance. However, implementations are more evolutionary as it takes time for customers to adjust to new virtualized service capabilities. Spectrum Enterprise is incorporating SD-WAN into its Ethernet services portfolio. SD-WAN technologies offer new opportunities for configuring and delivering services, said Verizon’s Hakl. A revolutionary aspect is the integration of NFVs to express policy-based application routing that enables networks to respond to a customer’s business intent. Verizon offers multiple managed SD-WAN options with integrated VNFs. 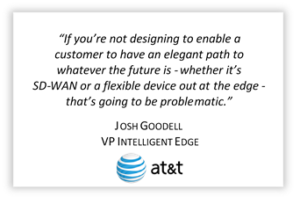 According to AT&T’s Goodell, SD-WAN is transforming the industry, and the service offerings will continue to evolve over time. Overall the market impact is more evolutionary, based on a gradual progression from static networks with limited on-demand functionality to fully dynamic predictive services. AT&T provides both OTT and network-based SD-WAN solutions. MEF 3.0 provides an important industry framework for defining, delivering, and certifying agile, assured, and orchestrated services over a global ecosystem of automated networks. MEF 3.0 encompasses virtualized network services, with initiatives underway for Carrier Ethernet, SD-WAN, Layer 1, IP, and more. The bottom line is that MEF 3.0 will play a vital role for the industry during the next several years as network operators develop, roll out and monetize more innovative, dynamic services for their customers. For more on our discussion about MEF 3.0, service innovation, SD-WAN and other topics, view the Service Innovation Panel video. Additionally, don’t miss the MEF18 global event in Los Angeles, October 29 – November 2, for the opportunity to network with leading industry players, and hear about their latest technology innovations. Another highlight of this upcoming event is the Proof of Concept Showcase, which features live demonstrations related to multiple MEF 3.0 implementation projects involving service providers and technology vendors.